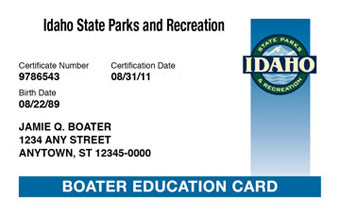 Currently there is no requirement in Idaho to obtain the boater education card. However an educated boater is a safer boater. Taking a boating safety course and obtaining your boating license could save your life and the lives of others on the water. Most marine insurance companies will recognize a NASBLA-Approved safe boating course completion certificate (including the BOATERexam.com® course). By taking this course you could save as much as 15% on your marine insurance. Please consult with your insurance company for more information. Currently there are no state-wide age restrictions to operate a boat in Idaho, however certain counties have local ordinances that limit the age of boat operators. Before heading out on the water, be sure to check with local authorities for age restrictions where you will be operating. You can also consult the Idaho Boating Program's FAQs at parksandrecreation.idaho.gov. The online boating safety course covers a wide range of operating laws in Idaho. For a complete listing of Idaho’s boat operating rules and regulations, please consult the Idaho Department of Parks & Recreation website at parksandrecreation.idaho.gov.